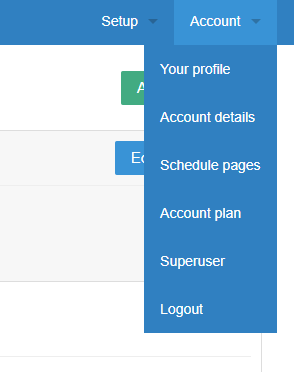 You can find the Schedule pages section after clicking on the Account drop-down menu from the top of the admin site. Here you can manage the title of your schedule page on the Public pages as well as links for Calendar feeds and the administrators that are setup on your account. Click edit title underneath the public page URL to choose what the title of your schedule page will be on your public pages. You can also use the 'Published' toggle to determine if your public page is visible to your bookers, or only admins. Calendar feeds can be set up on your account to link your Bookwhen schedule to another calendar feed (e.g. Google, Outlook, Apple, etc.). You can access the URLs needed to create these links here by clicking on whichever of the 3 types you require (Public feed, private feed, or private feed [sparse]). You can find more information on setting up calendar feeds here. No access - User cannot create and alter entries or bookings. Bookings only - User has access to manage bookings only. 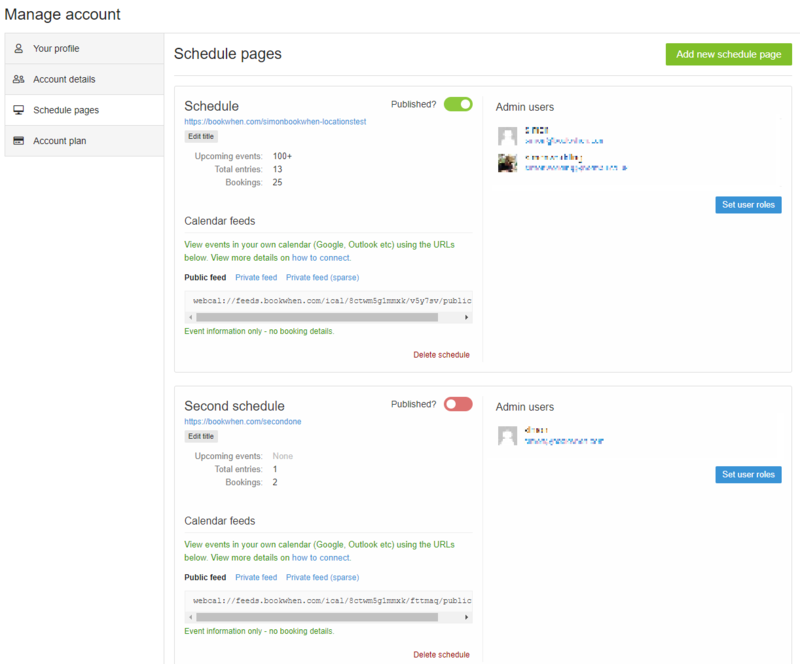 Setup & bookings - User can create and alter entries and manage bookings. Click on delete schedule to delete your schedule page - you will be asked to confirm twice before this decision is finalised, first by clicking on ‘ok’, then by typing ‘DELETE’ and clicking Delete schedule.